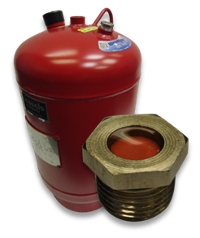 When an expansion tank is improperly installed or the internal diaphragm is compromised, all system pressures are in turn compromised. System pressure and safety components are often misdiagnosed as the culprit of these wild pressure swings and subsequently replaced. As you can imagine, there are high costs associated with such misdiagnoses. To combat this problem, Wessels Company has introduced WessView® featuring exclusive, patented technology for maintenance troubleshooting of any diaphragm tank. This simple device allows for fast, accurate assessment of the expansion tank’s integrity by changing color from white to red in the case of a compromised internal diaphragm.